Support your local bookstores in Victoria, BC, and beyond! Ebooks are fun but bookstores serve as crucial cultural and knowledge hubs. In addition, with the rise of online booksellers, local bookstores are also rare and wonderful ‘real world’ places full of opportunity for discovery and delight. 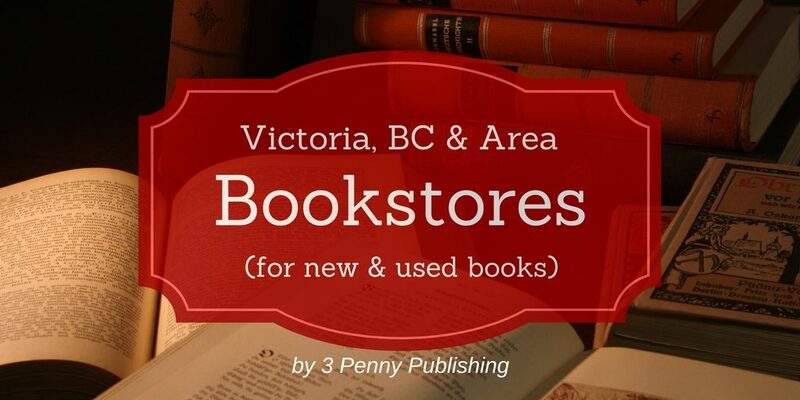 Below is a list of Victoria and area bookstores. Be sure to pay them a visit, enjoy the ambiance, and buy a few books. Also listed are a few other noteworthy book places in Vancouver and elsewhere. Bolen Books is one of the biggest indie bookstores in Canada. Munro’s Books is rated one of the best bookstores in world. Russell Books has both new and used books with 2 downtown stores. Chapters Indigo Canada has 3 floors of books and gifts downtown. Tanner’s Books in Sidney is a large store with new books, magazines, maps, calendars and a large children’s section. Ivy’s Books is nestled behind the tweed curtain in Oak Bay. Legends Comics & Books is downtown near City Hall. Crown Publications carries Province of BC publications. Royal BC Museum carries a large number of BC books in their gift shop. Chronicles of Crime specializes in mystery, noir, and vintage books. Sorensen’s Books shares space with CoC (above) and has a large selection of history, art, ephemera, and rare books. Bastion Books (taken over from Renaissance Books) has art, history, modern first editions, contemporary and vintage books. The Haunted Bookshop is the oldest bookstore on Vancouver Island and gets visitors from all over the world. Camas Books has a wide variety of books on social movements, environment, social justice, and more. Cavity Curiosity Shop & The Vorpal Gnome a very small shop brimming with music, books, art, and pop culture. James Bay Coffee & Books serves up books, coffee, and live music events. Bring & Buy Books (no website) is located 1241 Esquimalt Rd. Call for details: 250-382-1241. Galiano Books on Galiano Island. See profile in The Guardian. Period Fine Bindings (Oak Bay) is an amazing place for those fascinated by antiquarian books. Audible – Super popular, heavily advertised, but also under fire by indie bookstores (read critique by Cory Doctorow). Libro.fm – Lauded for working well with indie bookstores. Scribd Reading Service – Reviewed by The Verge and Business Insider. Know of a bookstore that should be listed? Send an email. Related: Traditional Publishers in Victoria, BC.